Bringing Marlene's dream treehouse to life in Oregon was such a joyful project! Marlene asked us to create an idyllic guesthouse, outfitted with plenty of space to host her grandchildren for a night in the trees. This spacious treehouse consists of two pods and holds many comforts of a modern home. 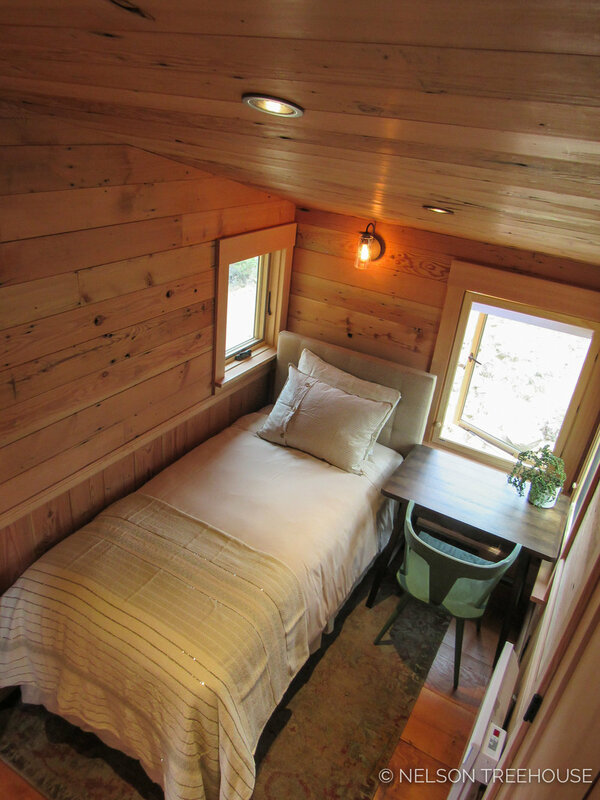 You saw Marlene's main pod come together on Treehouse Masters—read on for a look inside the second, "bunkhouse" pod! Marlene's treehouse roosts on a slope in a grove of ponderosa pine trees. Nine 8 x 8 steel posts provide additional support. At its highest point, the treehouse rises 16 feet off the ground. Each pod is accessed by a separate bridge. Marlene's master pod is on the left and her grandkids' bunkhouse pod is on the right. The master pod holds a dreamy bedroom, plentiful storage space, wet bar, living room, and full bathroom. The flooring is made of reclaimed Douglas fir. A window near the bed peeks out to one of the host pines. It's a sweet reminder that this bedroom is up in the trees! What's a guesthouse without a wet bar? Built-in storage, like this laundry closet and shelving, is key for keeping space open in treehouses. Each pod has a bathroom with running water. The master pod also has a tiled shower! Each pod has two decks: an entry deck and a larger deck out back. The back decks provide sweeping views of the arid alpine forest and nearby mountain range. The walls of the living room are lined with windows, which let in lots of natural light. A Travis Industries stove keeps the room cozy and warm. An enclosed sunroom leads to the second pod, which is outfitted with two bedrooms and another bathroom. The bench in the sunroom opens up as additional storage space. This bunkhouse pod provides plenty of space for treetop slumber parties! Our crew's favorite cedar paneling covers the exterior. Natural branch railing posts add a rustic touch to the deck. It was truly a privilege to build this relaxing retreat for Marlene! We wish Marlene and her grandchildren many happy times up in the trees.